The day of his birth was not recorded. Disciple of Mimasu Daigorô IV, he started his career at the beginning of the 1850s, performing under the name of Mimasu Tokumatsu II. 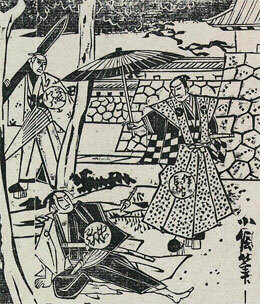 He became a disciple of Nakamura Fukusuke III and took the name of Nakamura Fukunosuke IV in 1873. He died in 1884. Born the 6th day of the 6th lunar month of 1871. Disciple of Nakamura Shikin, he received the name of Nakamura Umenosuke and made his debut on stage in March 1884. He took the name of Nakamura Fukunosuke V in 1889 and was active up to his death the 10th of January 1918. The day of his birth was not recorded. Disciple of Nakamura Masajirô II, he made his debut on stage at the beginning of the 1890s, performing under the name of Nakamura Masajaku. He took the name of Nakamura Fukunosuke VI in October 1918 at the Naniwaza but he did not hold for a long time as he died the 9th of October 1921. Born the 15th of January 1917. Disciple of Nakamura Fukusuke IV, he made his debut on stage at the beginning of the 1920s, performing under the name of Nakamura Masatoshi. He took the name of Nakamura Fukunosuke VII in summer 1935. The day of his death was not recorded. The actor Nakamura Tamasuke, who held the name of Kagaya Fukunosuke I from 1788 to 1790, was also called Nakamura Fukunosuke I. The actor Nakamura Baigyoku IV, who held the name of Kagaya Fukunosuke II from January 1956 to March 1967, was also called Nakamura Fukunosuke II. The actor Nakamura Fukunosuke III is the current holder of the name since October 2016.